CELTIC NECKLACES : SCOTTISH Made : LOVE2HAVE in the UK! The BEST! Quality women's silver Celtic necklaces all handmade in Scotland at prices you can afford, fully guaranteed and returns accepted. 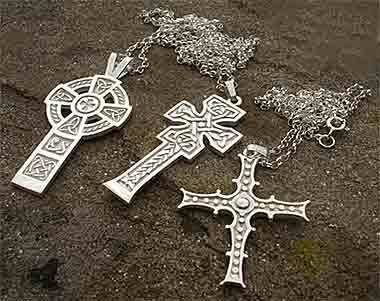 Most of the Celtic jewellery that you may come across is usually quite lightweight and made from cheap silver. What's more, is that much of this low-quality Celtic jewellery is made abroad in far away places and produced using cheap labour, designed and made by people who have probably never even heard of the word Celtic before, let alone visited our Celtic nations. At Love2Have we have ensured that our customers get the best choices. Not only have we decided to feature the most unusual or alternative in Celtic designs, but the most authentic too. We are extremely pleased with our selection of choices we have on offer for our customers in this section as we have not only catered for the traditional in the form of our silver Celtic cross necklace, but also for the very modern and contemporary too. Many of the Celtic necklaces in this section are all painstakingly made by hand from a Scottish designer based in Orkney, a land famous for its Viking ancestry and also Celtic history. We regularly get asked about chain lengths for these pieces and all of them here can be adapted to any size if necessary. If you see something you like but need it in a different size, please don't hesitate to contact us and we will be able to advise further. Something else that will be of interest too is that most of the designs here are available as matching Celtic jewellery sets and you will find the Celtic earrings and silver Celtic bracelets on our website also. Prefer a non-leather version of one of our leather Celtic necklaces?